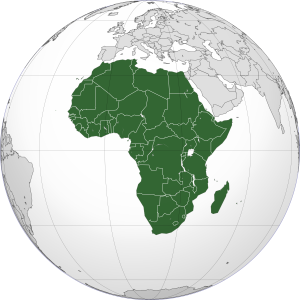 Africa is the second largest continent in terms of area, after Asia. It covers 30,244,050 square kilometers (mainland and islands together), which is 20.3% of the total land surface of the earth. More than 1 billion people live there, which is about one-seventh of the world’s population. Almost all of Africa belongs to the third world. Some people consider the entire continent like this, others only the countries south of the Sahara, with the exception of South Africa. The name Africa was originally reserved for the area of ​​present-day Tunisia. The Roman province of Africa covered the Tunisian and Libyan coastal areas. Later the whole coastal strip was called Africa and in the time of the voyages of discovery the entire continent was designated. The geography of the continent of Africa is varied. Under the rich and fertile north coast lies the dry Sahara desert. There are many rainforests south of the Sahara. The south and the east of the continent consist largely of savannas: dry grass plains with trees and shrubs here and there. The rest of Africa consists mainly of grassland. The Atlantic Ocean lies on the west coast and the Indian Ocean on the east coast. In the northwest, Africa is separated from Europe by just a few kilometers of sea and in the far northeast by the water of the Suez Canal of Asia.